U.S. Companies Are Buying Back Too Much Stock -- Or Are They? There isn't always a tradeoff between returning cash to shareholders and investing in the business. Are companies spending too much money on share repurchases to pump up their stock prices, rather than investing in innovation? At first, the answer seems clear cut: U.S. companies have spent a stunning $2.1 trillion on share buybacks over the past five years. In fiscal 2014, share repurchases and dividends exceeded net income among the more than 3,000 non-financial companies tracked by Reuters. Furthermore, share buybacks have increased dramatically in relation to both R&D spending and capital expenditures since the 1990s. However, companies don't necessarily have endless growth opportunities. As I noted last month, sometimes it doesn't make sense for a mature company to pour a lot of money into growth initiatives. Those investments may lead to little or no incremental profit. But there's another reason why companies may be buying back more stock than ever before: Interest rates have plummeted to record lows. As a result, companies ranging from Apple (NASDAQ:AAPL) to American Airlines (NASDAQ:AAL) have found that they can invest a lot of capital while also aggressively repurchasing stock. After spending a total of $13.5 billion on share repurchases during the first half of fiscal 2016, Apple spent more than $10 billion on buybacks just in the last quarter. The company recently boasted that it has returned nearly $177 billion to shareholders through buybacks and dividends in the past four years. Through the first three quarters of fiscal 2016, Apple's share repurchases were up nearly 8% year over year, even though its net income was down more than 13%. The combination of rising buybacks and falling earnings might appear to seal the case against Apple. However, the iPhone maker also increased its research and development spending 28% year over year and its capital expenditures (including acquisitions of intangible assets) by 21% year over year. Indeed, both capital expenditures and (especially) R&D spending have grown at a staggering rate for Apple over the past five years. Any shortfall in the company's revenue and earnings growth isn't for lack of trying. 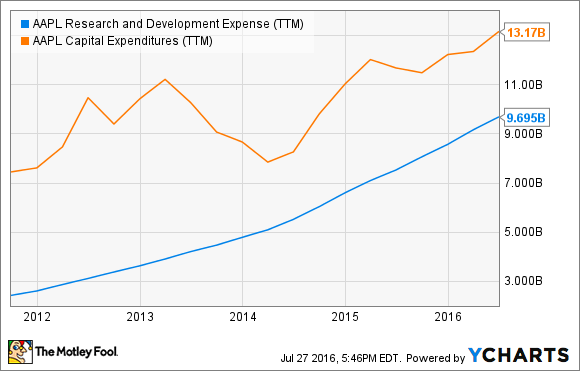 Apple Research and Development Expense and Capital Expenditures (TTM) data by YCharts. Apple hasn't had any trouble paying for its rising buybacks along with investing in the business. The company has more than $230 billion in cash and investments on the books. And while most of that cash is trappe" outside the U.S. -- Apple would have to pay repatriation taxes to use it for buybacks -- the company has raised $85 billion in debt with an average interest rate well below 2%. Meanwhile -- in a completely different industry -- American Airlines is buying back stock even more aggressively than Apple. Over the past four quarters, the company has spent about $5.8 billion on share buybacks: a staggering amount, considering that the company's market cap is currently less than $20 billion. However, American Airlines has spent roughly the same amount (approximately $6 billion) on capital expenditures in the past year. Indeed, while it is buying back more stock than any other airline, it is also spending more on capex than any other airline. 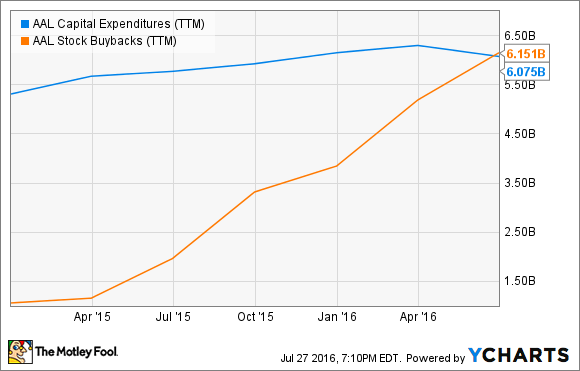 American Airlines Capital Expenditures (TTM) data by YCharts. Like Apple, American Airlines has been able to invest record amounts of capital while returning record amounts of capital to shareholders due to the low interest rate environment. American Airlines ended last quarter with total debt of $22.8 billion, up from $18.8 billion a year earlier. Despite having a much weaker balance sheet than Apple, American Airlines still pays very low interest rates -- currently about 4.4% on average. The lesson is clear: At some point, companies may be forced to choose between investing money and returning it to shareholders. However, for now, the ready availability and low cost of debt means that companies can spend huge sums on both capex and share buybacks.